US, UK covers - the UK version is more fun. My dad taught me to appreciate the distinctions between one font and another. Before I finished high school, I knew about serifs, descenders, x-height, and Bodoni Bold. This was secret knowledge exclusive to graphic artists (and their attentive children). Then, desktop publishing happened, and suddenly, everybody seemed to know about Baskerville, Times New Roman, Optima and Helvetica. Fonts became cool. A movie was made about Helvetica. 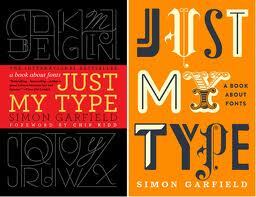 Now, there’s a surpassingly energetic–and fun!–book about fonts, Just My Type, written by Simon Garfield. In it, you’ll find the unfortunate story of Comic Sans, and the movement to eradicate its use. I never thought much about the reasons why we have Helvetica, Ariel, Univers and Futura. And why I started to use Frutiger and Gill Sans in place of other sans serif fonts. Or why I never loved Brush Script or Souvenir. Turns out, each of these fonts is part of a story, either about technology’s progress or shifts in public sensibility or the renovation of a mass transit system (which requires signs of every size, plus maps). Yes, this book is ridiculously geeky. No, there’s no reason why chapters must be read in order. Yes, there are lots of pictures–and examples that reminded me of our graphic past as defined by Gilligan’s Island, Obama’s first presidential campaign, the London underground, Letraset and Dymo tape, Pet Sounds, Penguin Books, Ikea, and T-Rex. I wish I had the patience to read every story of every type font, designer and context. And I wish there were dozens of visual examples–more and more visuals to tell this very visual story.